LORAN (LOng-RAnge Navigation) is a radio-navigation system using long-wave signals transmitted from terrestrial transmitters (as opposed to GPS, which uses satellites). 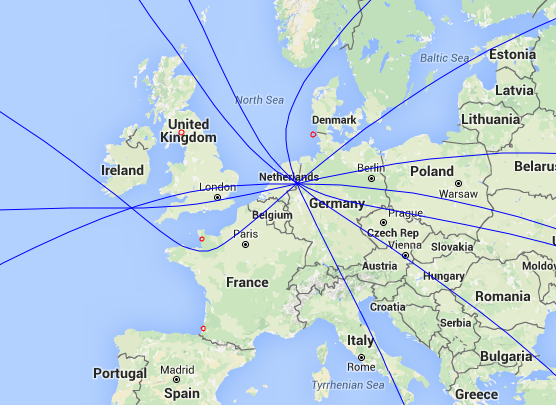 On December 31, 2015, most LORAN stations in Europe were shut down. This page shows the last signals received from them, and how to determine (for the last time) the receiver's location from them; it was a navigation system, after all. The signals were received using my WebSDR system at the University of Twente, with modified software to record the raw data for later analysis. I still have the recorded raw data; please contact me if you need a copy of it. The horizontal axis shows time, the vertical axis the received signal after an 85-115 kHz bandpass filter. The multiple lines should be read as text: from left to right, from top to bottom. The horizontal axis is exactly 67.31 ms long. Thus, repetitions of a signal after 67.31 ms will be aligned vertically. This 67.31 ms is the repetition time (called GRI for Group Repetition Interval in LORAN-speak) of the strongest LORAN chain at my location. We see indeed four bunches of pulses repeated on every line, originating from Lessay (NW France), Soustons (SW France), Anthorn (UK) and Sylt (NW Germany). The Lessay signal is recognizable as being the "master" by its 9th pulse; the others then are only identified using published information about their transmission order. Some other bunches of pulses do not repeat at the 67.31 ms interval, but at a different interval: those belong to other LORAN chains. In fact, Lessay and Sylt participate in two chains: the 6731 chain and the 7499 chain (with 74.99 ms period). After 4 lines, the Sylt transmitter doesn't return: it has been shut down first. Its last transmission was for the 6731 chain; its last burst for 7499 can be seen at the beginning of the line interfering with Lessay's transmission. (Note that Sylt was master for 7499, so that burst has a 9th pulse). This leaves Anthorn as the lone remainder of the 6731 chain. Apparently it will not (yet?) be switched off. 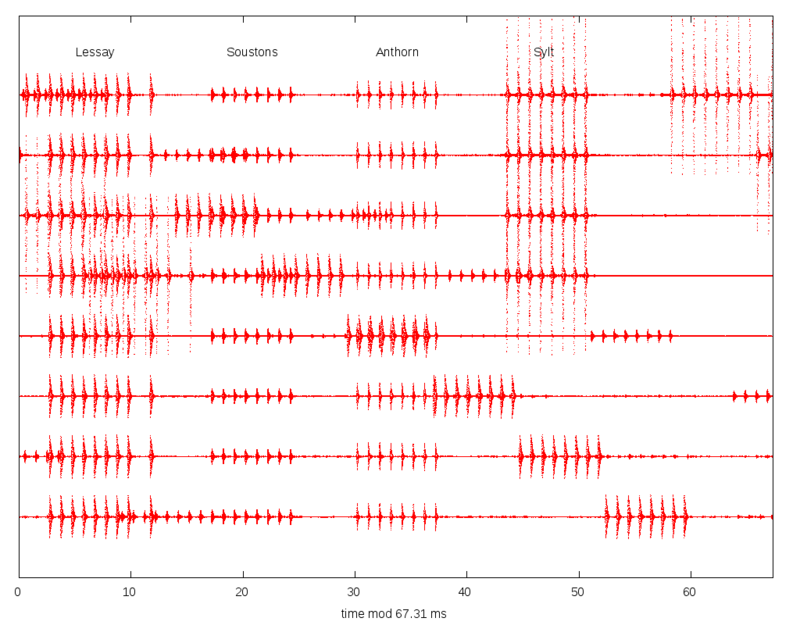 The plot also shows pulses from other chains; the strongest of these, starting at top left, and overlapping partially with Soustons's last transmission, has a repetition interval of 80.00 ms, so it must be from the western Russian GRI=8000 CHAYKA chain. Three other chains have been switched off simultaneously with the 6731 chain; apart from Lessay and Sylt's contribution to the 7499 chain, these other switched-off stations were to weak to easily spot among the 6731's signals by eye in the graphs (but they surely could be identified using more advanced analysis). Now let's try to determine the receiver's location from these signals: the fourth line of the first picture, i.e., the last period in which all four transmitters were still active. It doesn't matter much which zero crossing we timestamp, as long as we do it consistently the same for all transmitters. Here, the chosen zero-crossing of Lessay is found at 2.694 ms. Doing the same for Soustons, Anthorn and Sylt, we find 17.175, 30.165 and 43.520 ms.
Now we have to subtract by how much Soustons, Anthorn and Sylt transmitted their pulse later than Lessay did; on http://www.loran-europe.eu/viewpage.php?page_id=10 we find that these values are 13, 27.3 and 42.1 ms, respectively. For reference, the sites of the four stations are indicated by small red circles. The red circle is the actual location of the receiver. The above was just a quick and simple manual procedure, with an outcome that's nice, but not nearly as good as GPS provides. They could average multiple pulses and determine the zero-crossing more precisely than to 1 microsecond, as I did here. They'd probably not trust Google Maps to do the distance calculations, as I did here; e.g., I don't know whether Google Maps takes into account the fact that the earth isn't a perfect sphere. They could take into account terrain differences (water/land/mountains) to estimate the propagation times more precisely. Text and pictures (except the google maps data) on this page are copyright 2016, P.T. 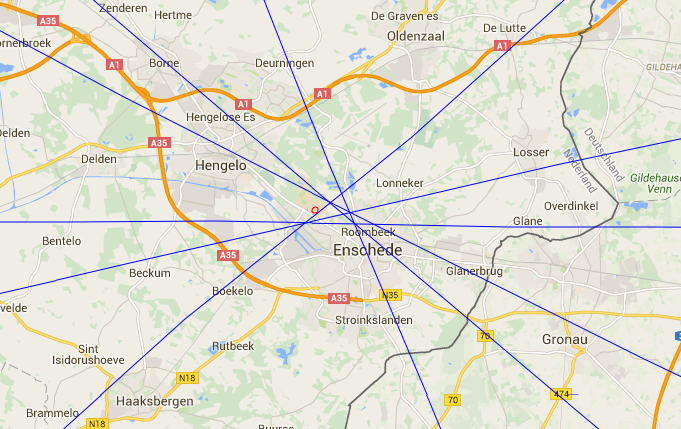 de Boer, pa3fwm@amsat.org .